Those who love to blog always prefer blogger as their blogging platform due to several reasons like first of all it's completely free and it do provide some gretest flexibility for their user.So if don't have enough money to buy a host they you can go for blogger as it is provided by google,so it's the most reliable and trustworthy also.Earlier many people started discussing that google is going to stop that free blogging platform and will close it very soon but suddenly google started updating this free blogging platform with some new features and make us feel relief that they is not going to shut it down.So,have you seen blogger newly introduce template HTML editor?If not then you must.If you're a web developer and like to tweak templates then we bet you must like it.So here we'll discuss about this html template editor introduced by blogger. 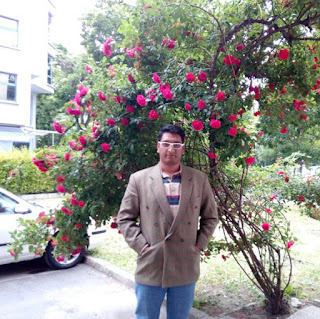 Previously blogger template editor was one of the headache for the webdeveloper as it was bland,shapeless html editor but this new html editor do have some awesome features. While editing or tweaking in the editor you might face errors like “Error parsing XML, line 297, column 3” here the line number would assist you in finding the exact location of the error. Previously, there were no lines numbering functionality. 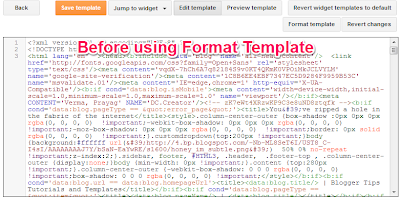 This is precisely awesome feature for web developers who develop templates for their living. 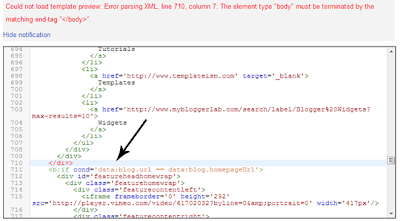 The new HTML editor also has error highlighting function that highlights those tags which are causing the errors. For example, you forgot to close the script tags properly and tried to preview the template so it would highlight the <script> tag to let realize you that you forgot to close the tags properly. This new feature would help you in managing and writing new codes. With syntax highlighting, you would see a colorful coding which would help you to understand the infrastructure of your template. Different colored div class, Id, and etc would assist you in writing meaningful coding. I guess this is the most finest improvement made to the editor is the addition of “Jump to the widget” tool that directly assists you to find out the coding of a certain widget attached to your site. For example, locate the “PopularPosts1” widget quickly through the drop down menu located on this tool. White you are busy in writing the coding the auto-indention feature automatically arrange the structure of your code in a systematic manner, so there is no need to arrange the coding manually. Since, it will automatically indent your codes while you are writing, so it would allow you to write beautiful coding in a quickly and will save lots of your valueable time.. This feature allows the user to selectively hide of show a section of a code that is not currently in use. In other words, this allows the user to cope those large sections of codes while viewing only those which are currently in use. Using an arrow you can show or hide the widget coding. For more details you may take a look on the following screenshot. 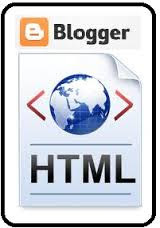 Giving a option to preview the template in the same window is certainly a well improvement of this new HTML editor It will surely improve the workflow of many blogger template designers. If you are like me , trying to squish every whitespace out of your template to hyper-optimize for the smallest HTTP request size , then this might not be a feature for you. Jokes apart as you can see in the above image it can be a nightmare to edit a Template like that. A click of Format Template will indent your code in the most human readable form as seen in the image below . Just a word of caution though , for heavily modified template this might cause some problems , so Preview before saving any changes. That's it. 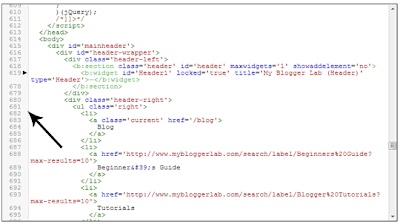 With a bit of effort, we can easily familiarize with this new HTML editor.For more info, check out this post on the Blogger Buzz blog, where Google software engineers +Samantha Schaffer and +Renee Kwang explained the steps of using the new Blogspot HTML editor. First I saw this I was worried because I have to study it again. I'd like the old one, less work and fast post.